India Makes a Marked Representation at June HK Show 2018. 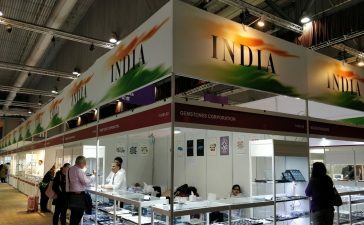 India made a strong representation with 42 of its leading gem and jewellery companies at the recently concluded June Hong Kong Jewellery & Gems Fair 2018. This enthused participation mirrors the potential of Hong Kong as a market for India. Mr. Pramod Agrawal, Chairman, GJEPC noted that in 2017, Hong Kong stood as the largest export market for India’s gem and jewellery industry. The India Pavilion encompassing the Indian representation was organized by the GJEPC. It housed exhibitors in diamond, jewellery and coloured gemstones. India enjoys the repute of a global hub to source quality gems and jewellery. The country’s gem and jewellery exports were at US$ 42 billion last year. Hong Kong was its main export destination in 2017 with total exports at US$ 14 billion or 33 percent. Cut and polished diamond exports to Hong Kong were worth US$ 10 billion; gold jewellery was at US$ 973.40 million, coloured gemstones (US$ 205.70 million). The June Hong Kong Jewellery & Gems Fair 2018 took place from 21 to 24 June 2018, at the Hong Kong Convention & Exhibition Centre (HKCEC). This edition was outlined with valued list of exhibitors and special events. It held up to its repute as a key sourcing event in the middle of the year in Asia. The 70,000 square meters of exhibition space was sectioned into specialty pavilions for buyer convenience. In its capacity as the apex body for the Indian gem and jewellery industry, GJEPC has continually made endeavours to promote the country’s exports. Some of these initiatives include organizing significant trade shows like the India International Jewellery Show (IIJS), Signature IIJS, India Gem & Jewellery Machinery Expo (IGJME). The GJEPC also organises India Pavilions for the Indian industry to participate at leading global trade events including JCK Las Vegas, Basel and Vicenzaoro. Focused business matching programs and Buyer-Seller Meets specific to products, delegations to important gems and jewellery centres in other parts of the world, are also taken up by the GJEPC. IGI’s Know Your Diamond Workshop Continues to Bridge the Knowledge Gap among Diamond Jewelry Enthusiasts.